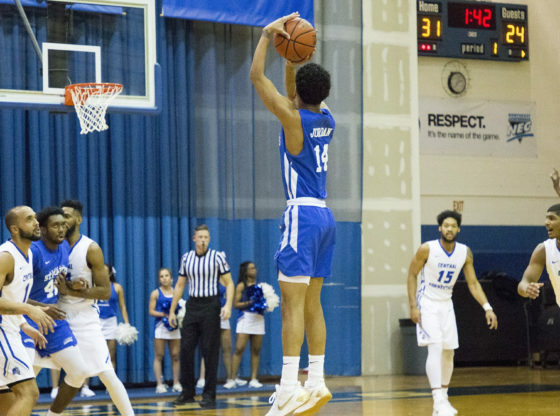 The St. Francis Brooklyn men’s basketball team (13-9, 5-4 NEC) suffered a 78-72 loss to Central Connecticut State (9-13, 3-6 NEC) on Thursday night at the Detrick Gymnasium in New Britain, CT.
Tyler Kohl scored 29 points, 12 rebounds, five assists and two steals to help the Blue Devils their terminate a four game skid. The Blue Devils came out soaring, popping out to an early 10-3 lead giving with less then 5:00 to go in the first half. Though St. Francis Brooklyn would answer right back in jumping out to an 11-0 run around the 5:00 margin of the first half. This would ultimately give the Terriers their first lead of the game. But in the end, The Blue Devils would capitalize on their slight lead toward the ending of the second half. With 2:32 to play, The Blue Devils were up by one with 70-69 lead. From there on out, The Blue devils went on a 12-3 run to shutout the Terriers for good. Jalen Jordan would net a career-high seven 3-pointers to finish with 23 points for St. Francis.